16 Uhr Check-Out - Garantiert! Für einige von uns sind die Worte “costa-ricanische Boutique-Villen” mehr oder weniger alles, was es für die notwendige Begeisterung braucht. Wenn man dann noch “Pazifikküste” und “Halbinsel Nicoya” dazufügt, sinkt die Wahrscheinlichkeit, dass man weitere Überzeugungsarbeit leisten muss noch mehr. Für die anderen von uns kommt hier die Kurzversion: Costa Rica galt ehemals günstig reisenden Backpackern als Anlaufpunkt und hat sich mittlerweile auch auf höherpreisige Angebote umgestellt. Ein Ort wie das Casa Chameleon Mal Pais ist perfekt geeignet, um sich diesen Trend aus nächster Nähe anzusehen. Der Punkt ist: man hat seinen eigenen Pool. Man bekommt eine Terrasse, man bekommt eine Hängematte. Diese Grundausstattung reicht eigentlich schon, aber wir holen aus Gründen der Vollständigkeit gern noch etwas aus. Jede Villa hat es sich inmitten von sonnengeküssten Gehwegplatten und gemusterten Textilien bequem gemacht und genießt den göttlichen Komfort eines manikürten Betts aus tropischer Flora; man sollte die Türen offen lassen, damit dieser Anblick das erste ist, was man sieht, wenn man morgens in seinem großen Doppelbett aufwacht. Jede Villa verfügt über Meerblick und seinen natürlichen Begleiter die Hängematte sowie die Option in der Villa zu dinieren und Spa-Behandlungen zu genießen. Hier wird niemand verurteilt, weil er etwas auslässt, solange es nicht die ziellosen Nachmittage voller kleiner Schläfchen sind, wegen derer man hergekommen ist. Trotzdem lohnt es sich aufzustehen und sich ein bisschen umzusehen – zum einen für das Restaurant mit offener Küche aber auch, um sich neben dem Wasserfall beim Hauptpool herumzutreiben. Hier ist nämlich der Rest der Halbinsel zu finden: der “weißer Sand trifft auf Urwald”-Strand, der regelmäßig Top-Bewertungen einheimst und an dem Scharen von Surfern ihrem Sport in idealer Umgebung nachgehen. Mal País, das angrenzende Fischer- und Bauerndorf bleibt zum Glück vom Großteil der Touristen verschont. Holen Sie sich schon endlich ein Quad, so wie die Einheimischen, und gehen Sie auf Entdeckungstour. RESERVATIONS, PAYMENT, CANCELLATION AND PRIVACY POLICIES 1. 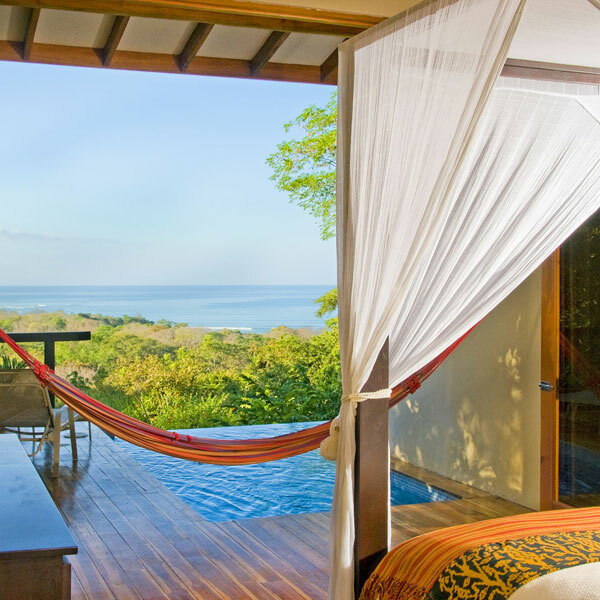 Privacy Statement: Hotel Casa Chameleon will maintain any and all information regarding our guests as private within our facility. 2. Check-In & Check-Out Times: Check-in: 2:00 p.m. Check-out 11:00 a.m. The hotel may accommodate guests prior to the official check-in or after the official check out time when requested prior to guest arrival and subject to availability. 3. No Children Please note that we are a COUPLES ONLY RETREAT. Children are only permitted with full resort rental. Due to safety regulations, exceptions are made based on children’s age and circumstances. 4. No Pets Including service animals 5. No smoking All of our Villas and the Restaurant Lounge area are non-smoking. The manager will indicate the designated smoking areas outside the villas on the terrace to accommodate the needs of guests who smoke. 6. Rates: 6.1 Rates are quoted for single, double, or occupancy per room and are for room only. All meals, beverages and additionals, such as telephone calls, faxes and spa services are excluded from the room rate. 6.2 Rates do not include government tax (13%). 6.3 All rates will be confirmed via an “e- Confirmation of Reservation” form sent upon receipt of payment. 7. 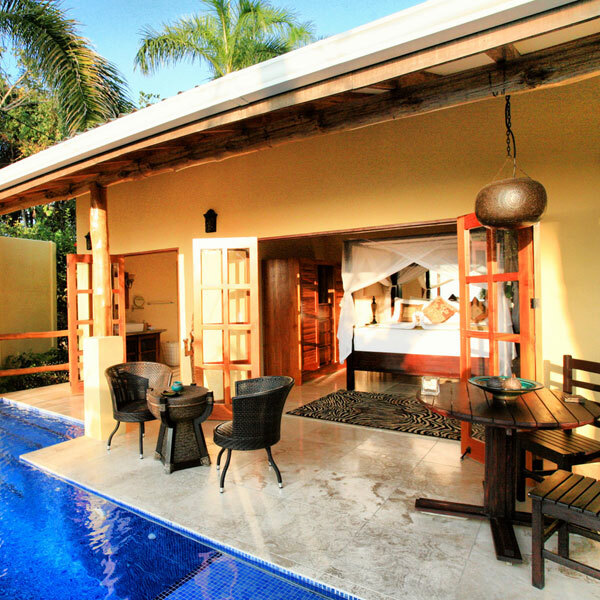 Reservations Casa Chameleon is a small and exclusive boutique hotel that relies on advance bookings. Full payment for the accommodations must be made at the moment of reservation. Please note that a reservation is not considered confirmed until a 100% deposit has been received. Upon receipt of your payment, you will be forwarded an “e-Confirmation of Reservation” form at which time you will be deemed to have accepted these terms and conditions. Agency bookings may be subject to special terms, please consult our reservation department for details: info@hotelcasachameleon.com 8. Cancellations Due to the intimate size of our hotel, cancellations affect us significantly; therefore, we are forced to adhere to a strict cancellation policy. No credit or refund will be given in whole or in part for days not used resulting from late arrival or premature departure. In case of a cancellation, notice must be received in writing, by email or fax, 90 calendar days prior to the arrival date, in which case full refund of the TOTAL booking will apply, minus any wire transfer or banking fees incurred. Reservations cancelled 89 to 60 calendar days prior to arrival date incur a penalty of 25% of the total amount. Reservations cancelled 59 to 30 calendar days prior to arrival date incur a penalty of 50% of the total amount. For cancellations made 29 calendar days or less prior to arrival date a 100% penalty will be applied. There are no refunds for Christmas/New Year's bookings from Dec. 21st to January 5th. We HIGHLY RECOMMEND TRAVEL/TRIP CANCELLATION INSURANCE. A list of providers can be found at www.insuremytrip.com1 9. Payments: 9.1 Payments are received in US DOLLARS or the equivalent in Costa Rican colons at the time of payment. Payments may be made through credit card: Visa, Master Card, American Express, Discover, JCB, Diners Club, or via direct deposit or wire transfer. Direct deposits or wire transfers must be previously arranged with our Reservation Department, and proof of bank transactions must be sent by e-mail to: info@hotelcasachameleon.com 9.2 BANK ACCOUNT INFORMATION Scotiabank de Costa Rica SAN JOSE, COSTA RICA SWIFT NOSCCRSJ ACCOUNT NO. 8033383577 FOR FINAL CREDIT TO ACCOUNT NO. 13000188001 IN NAME OF CASA CHAMELEON MANAGEMENT CORPORATION, SRL Corporate identification number: 3-102-537341 Company Address: Plaza Obelisco, San Rafael Escazú, San José, Costa Rica. Should your bank require an intermediary bank to process the wire, below is the information we use: INTERMEDIARY BANK: BANK OF NEW YORK, 1 WALL STREET, NEW YORK, NY 10286 ABA 021000018, SWIFT IRVTUS3N Please remember to include your name in the wire reference. Most banks charge a $10 - $25 wire transfer fee for international transactions. PLEASE CONSIDER THAT INTERMEDIARY BANKS MAY ALSO CHARGE A FEE. Please check with your bank at the time of making the wire to make sure your payment is received in full. Any outstanding amounts resulting from incomplete wires will be included in your account and charged at the end of your stay. 10. CREDIT CARDS Our hotel accepts all credit cards listed in point 9. Guests who wish to reserve with credit cards will need to complete, sign and send a credit card authorization form which can be requested from our reservations office. This form can be sent via email in a password protected document to: info@hotelcasachameleon.com. 11. Responsibility/Loss or Damage to Property Casa Chameleon is not responsible for any loss of or damage to personal equipment and/or property during your stay with us, or during your participation in any of our arranged activities including but not limited to any loss or damage to vehicles or property contained within such whilst parked in or entering/leaving the premises. We will not accept any responsibility for any delay, additional expense or inconvenience, which may be caused directly or indirectly by events outside our control such as late arrival of 1 Casa Chameleon provides this link as a courtesy to its clients for the sole purpose of providing information to facilitate their planning. We are in no way affiliated to insuremytrip.com or the providers listed within, and are not responsible in any way for their services. international or domestic flights, civil disturbances, fire, flood, unusually severe weather, acts of God, and acts of government or failure of any machinery or equipment. 12. Peak Season: Reservations for PEAK SEASON, whether made direct or by/through a travel agency, require a 100% NON-REFUNDABLE deposit at time of booking. Payments not received in a timely manner are subject to immediate cancellation of reservation without further notice. THERE ARE NO EXCEPTIONS. Minimum stay packages may also apply. 13. Holiday Minimum Stay Requirements: Depending upon the date of your visit, special holiday rates and minimum stay requirements apply:  Christmas and New Year’s: 5 Night Minimum Stay  Thanksgiving Weekend: 3 Night Minimum Stay 14. Go or No show charges: In accordance with our cancellation policies, there will be no reimbursements for noshow or early departure.